From the author of Pope John Paul II: A Biography comes a chillingly authentic conspiracy thriller based on actual, never-before-revealed facts surrounding the assassination attempt against Pope John Paul II. "One moment, the white-clad figure, holding on to the iron bar at the back seat of the white Jeep with the left hand, was blessing the faithful in a slow, circular motion of the right hand as the vehicle advanced gently through the human mass filling St. Peter's Square in the Vatican under the azure-blue sky of the May afternoon. The next moment, the figure in white was slumped, seemingly lifeless, in a pool of crimson blood sloshing in the rear of the Jeep..."
In May 1981, in the middle of the slow tour among pilgrims on St. Peter's Square, Gregory XVII, the beloved but often controversial French pope, is shot at close range. The would-be assassin is quickly caught and identifies himself as Agca Circlic, a Turk belonging to a terrorist group. But the recovering Gregory XVII-who has both deep faith and a philosophical turn of mind-is not satisfied with Circlic's arrest and sets out to discover who really wants him dead. He arranges to recruit Tim Savage, an American Jesuit and former CIA case officer, who soon discovers that the plot to kill the Pope originated not in the Middle East but very close to home. 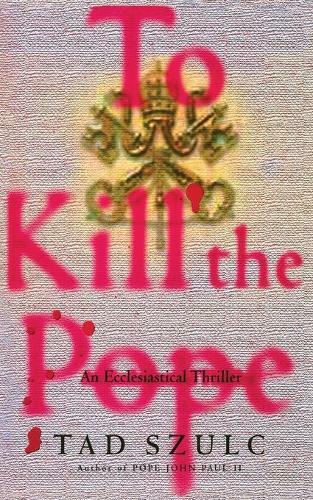 To Kill the Pope is a fictional treatment of the real-life assassination attempt on Pope John Paul II. In the course of researching his acclaimed biography of the Pope, Tad Szulc uncovered the truth about the conspiracy. The fictional format was chosen because, out of deference to his top-level sources, he could not reveal real names or disclose specific details. This information-including actual CIA testimony before United States Senate committees, the Agency's internal reports, French Secret Service involvements, and findings by Italian courts and Interpol-forms the basis for a shocking thriller that sheds new light on a key event in recent history.